My bustling farm has lots of animals running around. It’s all about Maslow’s hierarchy of needs. Sure, Maslow hasn’t come around yet, but your family could be an interesting case study. With just a small wooden house on a barren farmstead, things better get up and running soon if you’re to survive at all. Food is a little hard to come by, but you’re convinced that if you can just make it through this harvest, prosperity waits on the other side. You’ll fill this farmstead after all, and when you survey the work of your hands, you will feel actualized indeed. But first, you have to feed your family. 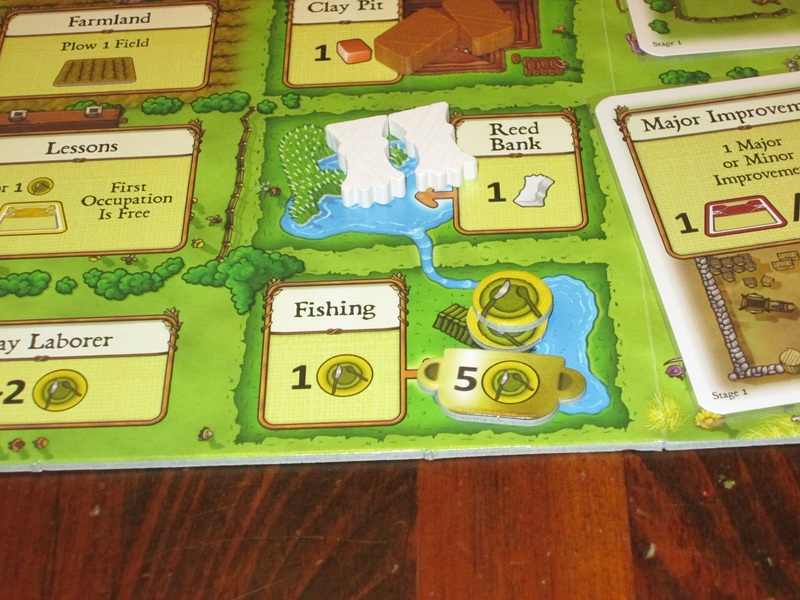 Agricola is worker placement resource management game for one to four players. 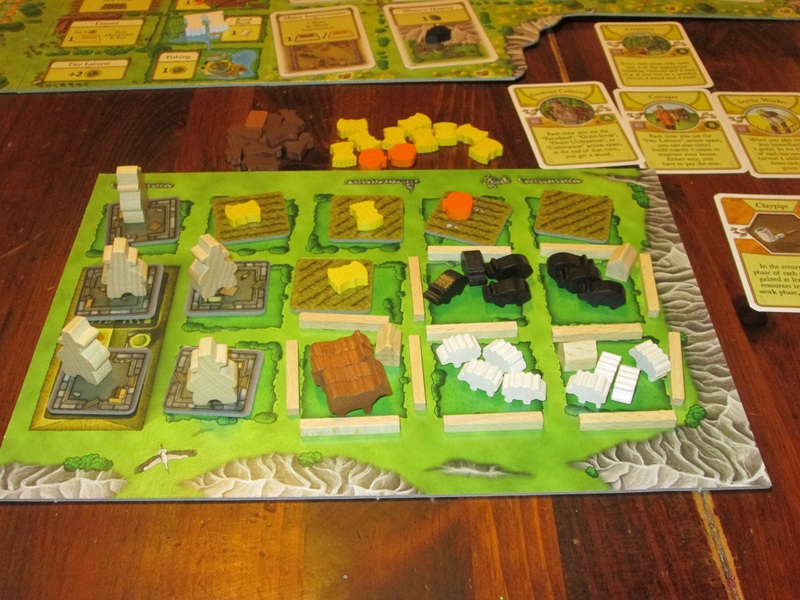 Players are farmers who are building a sustainable farm out of meager resources. The player with the most points at the end of the game wins. 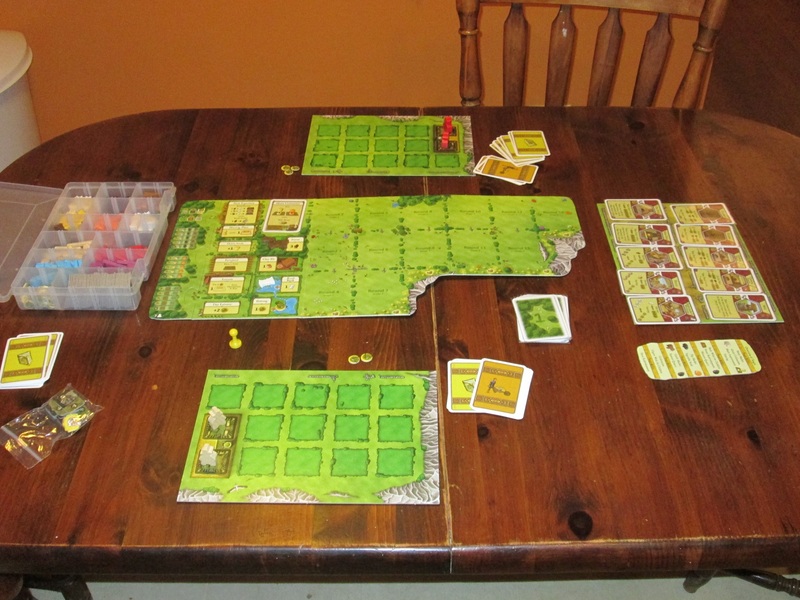 Agricola set up for two. The action board is placed in the center of the table, and each stage’s cards are shuffled and arranged in stage order. 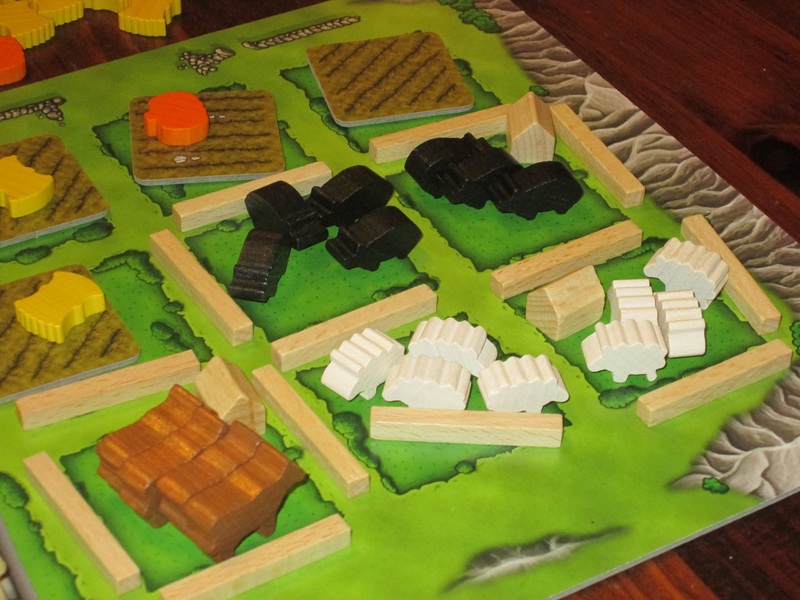 Each player receives a personal farm board as well as the player pieces of one color. Each player starts with two farmers, one for each room of their house. 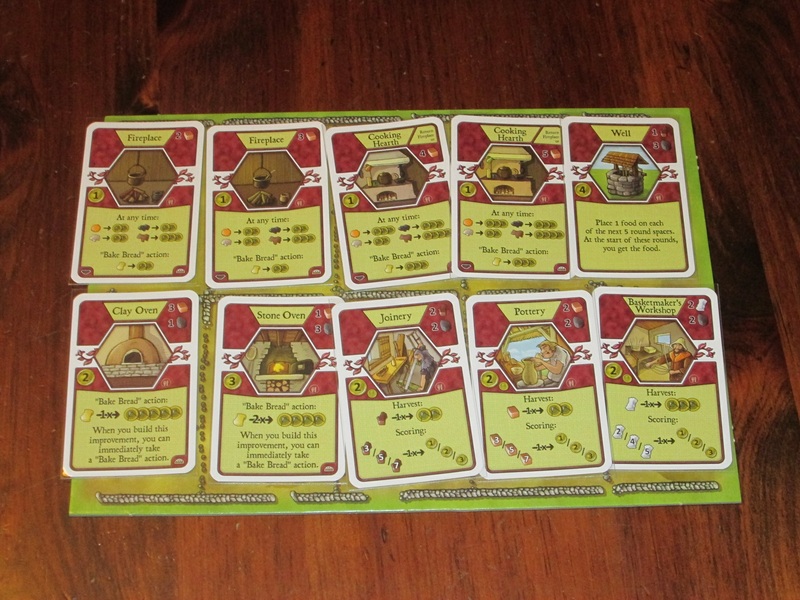 Each player also receives seven occupation and seven minor improvement cards. The possible actions and stage cards. At the start of each round, a new card is revealed from the stage deck. Then, resources are placed on each accumulation space on the board (most resources are retrieved from accumulation spaces). 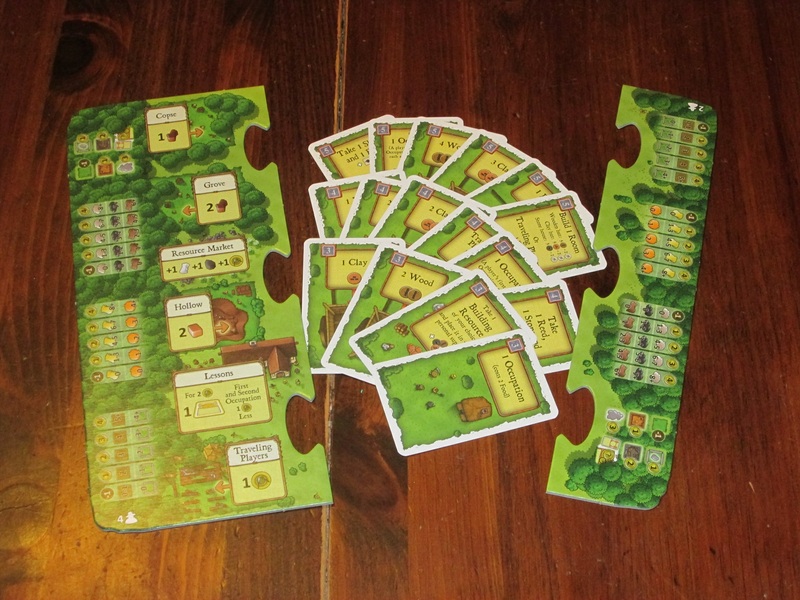 In turn order, players place their farmers on spaces of the board to perform actions like gathering wood, brick, reed, and food; cultivating fields and planting seeds; building onto or renovating their house; learning trades or making tools; and building fences and caring for animals. 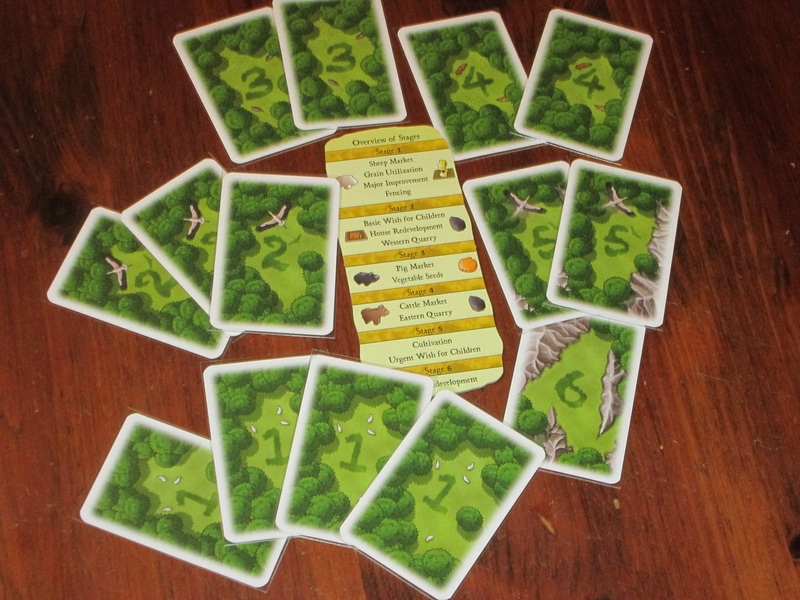 The actions get more efficient as the game progresses, and players can expand their family (get more actions to take each round) once they have expanded their house. 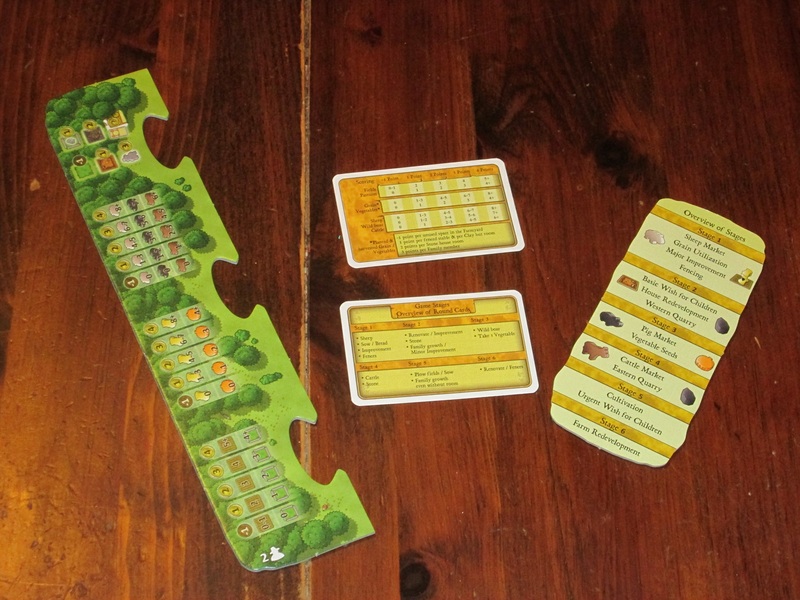 At the end of certain rounds marked on the board, there is a harvest: players receive the bounty of their planted crops and feed their family, and any animals that have at least a pair breed. The game ends after the sixth harvest. Players earn points for what they’ve done (and lose points for what they haven’t), and the player with the most points wins. Note: The rules appendix also includes several variants that can be included. There is a campaign game and a solo game, as well as several drafting variants for distributing occupation and improvement cards. Bustling Farmstead, or Reaping the Whirlwind? Agricola was the first heavy game I played after entering the hobby. I still remember punching the Z-Man edition–all that cardboard!–and imagining what each of the nondescript discs and cubes was supposed to represent. After I punched the game, Chicago was hit with a huge blizzard that kept both my wife and me home from work. 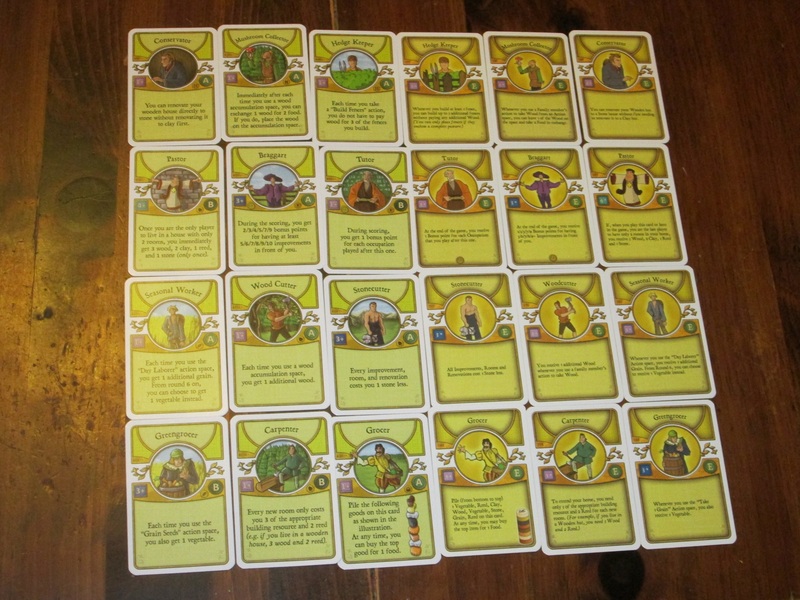 On that first day of playing Agricola, we played nine times in a row. So that should give you some sense that the game is good. The box is full of wooden and cardboard bits. I’ve organized mine in a plastic storage box for easier set up, but the game comes with an ample supply of plastic bags. But soon after the day of the blizzard, we experienced family growth (even without room), so we were both almost always too tired to play it, and I eventually traded it away. I was thrilled to get to try the new Mayfair edition and revisit this classic. Even though I would say I admire more than I like Agricola, it is still a very good game, and one worthy of your attention if you haven’t played it before. My farm near the start of the game. Things are slowly building. 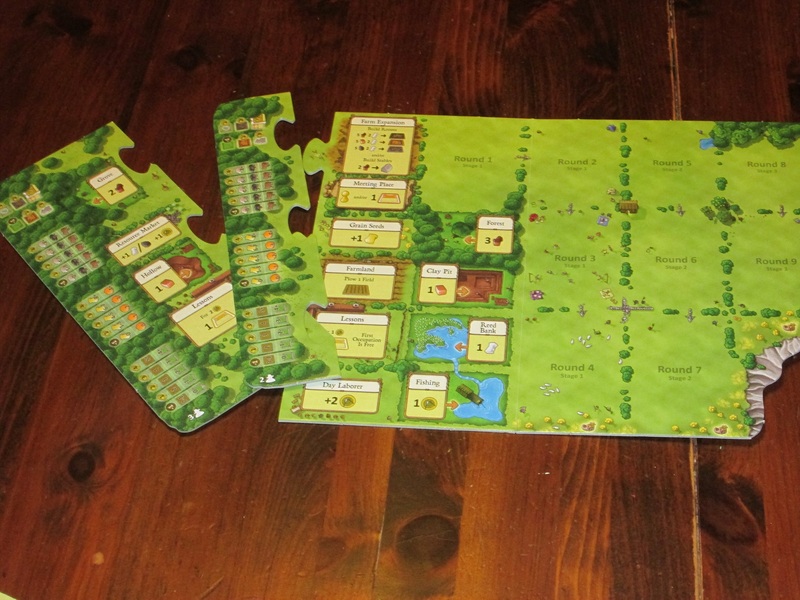 What makes Agricola so compelling is the sense of ownership players take of their farms. Players begin the game with a two-room house, a spouse, and a handful of dreams. For at least the first stage of the game (and often longer), players have only two actions to work with and at least eight things they want to do. Add to this the competition with other players over spaces on the board, and players can get frazzled. But the competition over meager resources means players usually have to take divergent paths. If one player takes the wood space, it’s unavailable for someone else; the next player has to devise a workaround. Because of this, each player feels something during the game that is more than just the satisfaction of participating in a puzzle; it is the satisfaction of a job well done. What you end with will certainly be better than what you started with. There is a board that snaps onto the main board depending on the number of players. This is HANDY. Agricola is one of the most thematic Euros I’ve played. It’s a heavy game with lots of rules to learn, but once learned, the rules usually stick because they make thematic sense. Planting and harvesting are simulated, for sure, but they follow the natural process that you would expect them to. Players have to feed their family, and they can do this with the livestock they raise (although maybe they won’t eat the pets they’re allowed to have…) or with the produce from their fields. Players become more efficient the more specialized tools they have or the trades they learn. 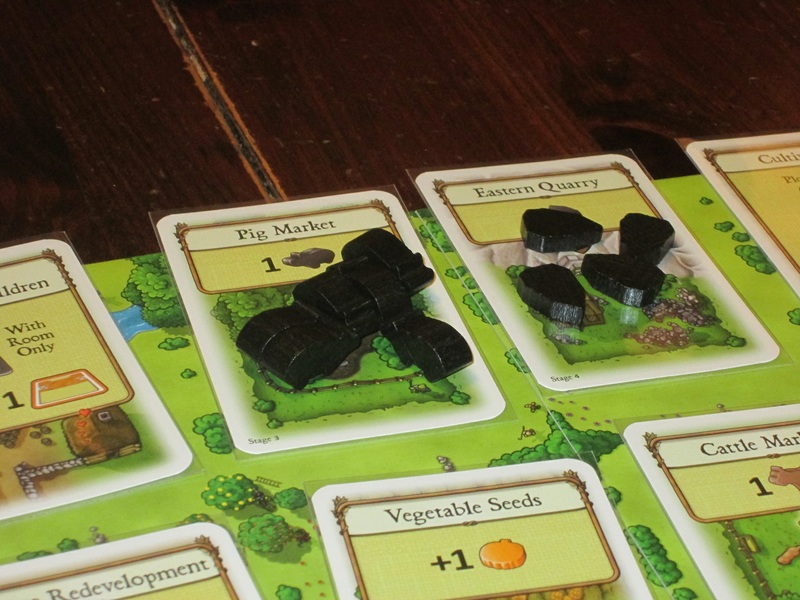 In an era where Euros seem to be moving more and more mechanical, Agricola reminds us that a game can be both mechanically interesting and a thematic simulation. Is it time to take the pigs yet…? There’s so much about Agricola to enjoy, even for someone like me, who usually finds worker placement games a little boring. One of the interesting aspects of Agricola is the accumulation spaces. Certain resource-gathering spaces on the board keep getting more resources each turn, even when no one claims them. This serves, similar to placing the doubloon on unused roles in Puerto Rico, to “sweeten” some spaces that would otherwise be overlooked. It also creates additional tension for players. Should they claim the resource they need now before someone else does, or should they let it accumulate–perhaps lessening the chance they’ll be able to take it but making the action more efficient if they do get it? It can feel like you’ve hit the jackpot when you get to load up on building resources, sending the other players home empty handed. Major improvements allow player actions to become more efficient and provide more points at the end of the game. I also enjoy the efficiency puzzle in the game. Because actions are so scarce, players are rewarded for efficiency. At the start of the game, players receive occupation and minor improvement cards to help them plan what course they should pursue. Occupations are just what they sound like: specializations and odd jobs that a player can get good at to help support the work of the farm. An occupation can be to tutor others, gather extra resources, build rooms outside the build rooms action, or collect resources even on non-resource-gathering spaces. 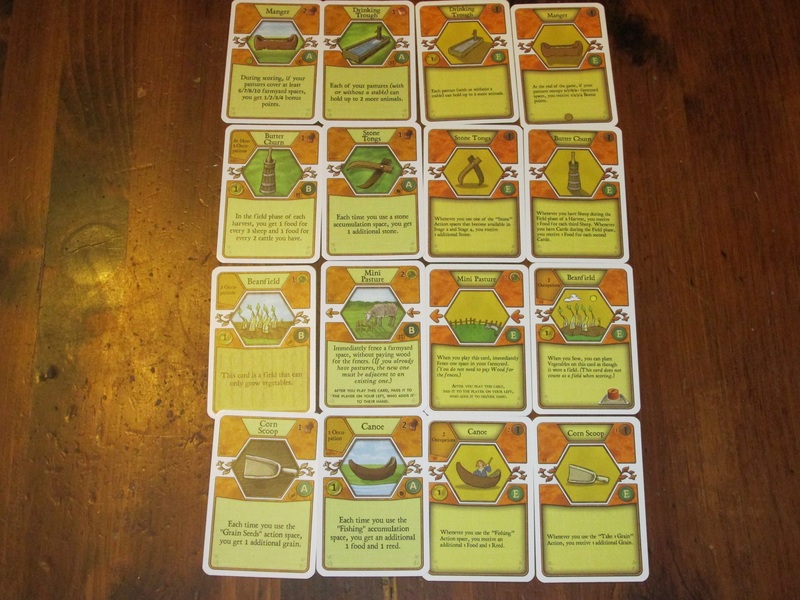 While it can be overwhelming to receive a hand of cards at the start of the game, these also relieve some of the tension of having to feed your family–even if your farm isn’t productive, as long as you know a trade, you can likely barter with your skills to get the resources you need. Minor improvements similarly help players to become more efficient at certain things, and these can usually be played as an action tacked on to a more powerful action. Some spaces become less and less enticing as the game progresses. 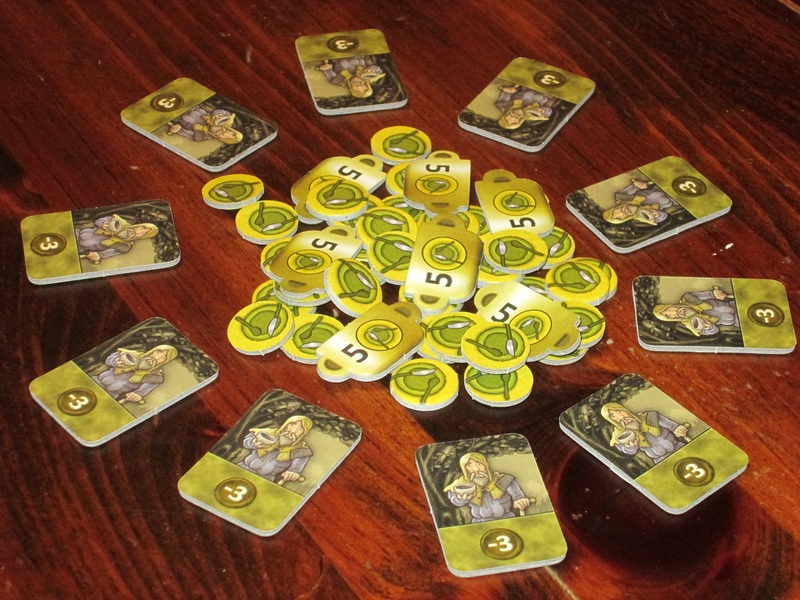 Agricola’s scoring structure rewards balance. While players want to max out their score in categories where they are strong, the game incentivizes diversity. You lose a point for each feature you don’t have, and even small points matter here, so it’s usually a good idea to achieve balance if you can. I like that because the game has clear scoring that matters to all players, player interaction is high. You have to take opportunities as they are presented, and sometimes that means claiming the first player marker so you can be sure to get the actions you want in the following round. And even though the game is interactive, it doesn’t feel spiteful. Yes, you can claim a space just so someone else doesn’t get it, but usually you’re claiming spaces simply because you need it to. That it gets in someone else’s way is just a bonus. 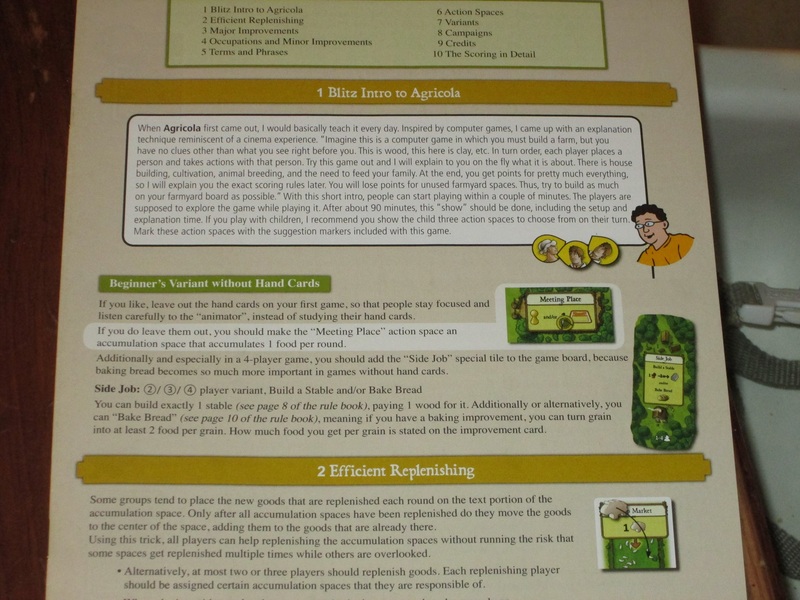 Agricola comes with a rulebook and a rules appendix. Yes, farming is hard work! Agricola is a very well-designed game, one that is deserving of its awards and high rank on Board Game Geek. So why do I say I admire it more than I like it? Simply put, Agricola feels like work. And it should, to some extent. The game is about farmers scratching out a living from the cold, hard earth. I worked on a turkey farm once, and it was hard work, even with the modern conveniences that make tasks easier. 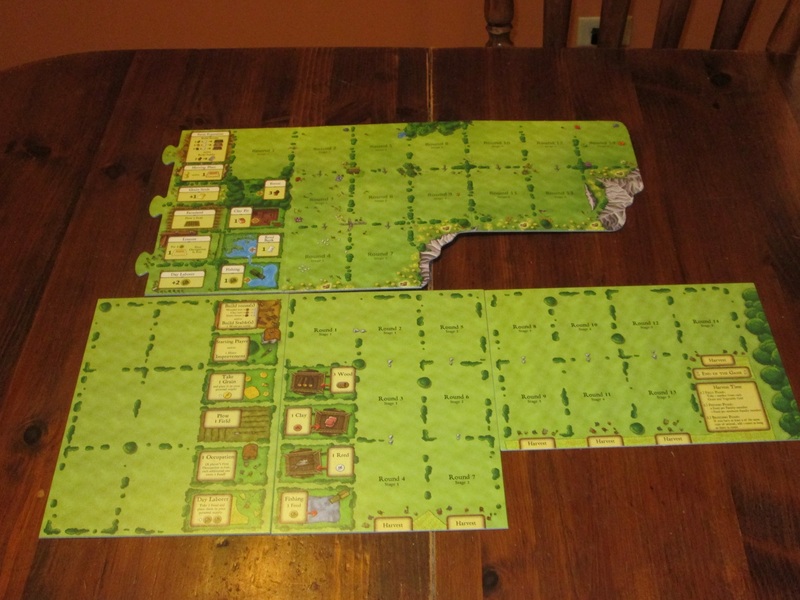 If Agricola is any indication, farming in the seventeenth century was no picnic. The whole game revolves around feeding your family. There’s the carrot of being able to do more once you have the requisite food. Then there’s the stick of having to take a begging token. All points to the same thing: feed your family! The game feels like work because of the central issue of the game: feeding your family (much like real life). The game channels everything toward this goal. Yes, you want to expand your farm; yes, you have grand designs to take on side jobs. But above all else, you must feed your family. You’re penalized every harvest for each food you can’t provide, and while taking these penalties is rare (each penalty is -3 points! ), it’s rare because the penalties are effective guardrails to guide the players in what to do. While expansion is nice, keeping your family alive is your chief concern. This is thematic and interesting, but it is also limiting. Games of Agricola tend to be tense. This is a good thing–if there’s no tension, there’s likely no game–but Agricola is wound so tightly that small missteps can dog you for the rest of the game. Again, this can be a good thing. You can be assured that in Agricola, the decisions you make matter. But it can also be frustrating, especially for new players, that their early blunders have kept them out of contention for the title. 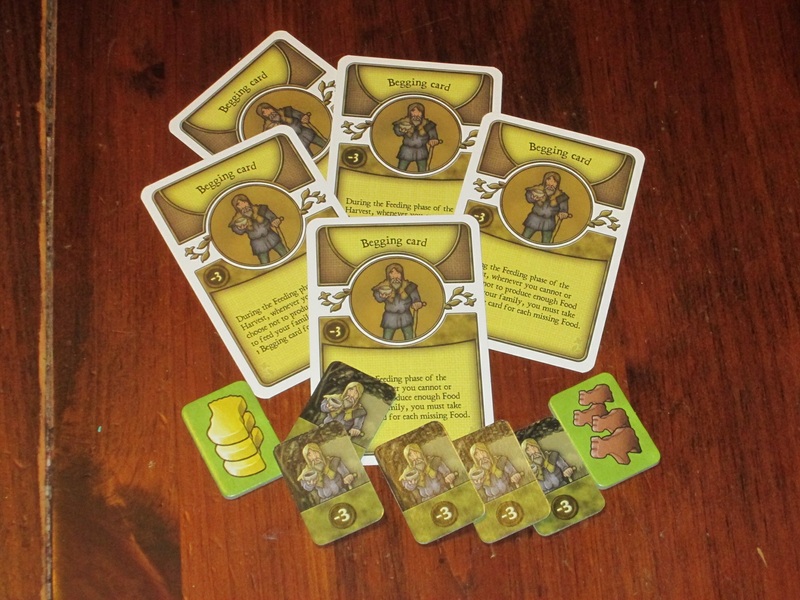 Because even little decisions matter, Agricola tends to involve a hearty amount of deliberation, especially if you play with the occupation and minor improvement cards. (Which you should: the game is decent without them, but the cards, while adding complexity, also help release some of the tension of the game.) Players have to consider what is the best use for their meager actions. Acquiring more actions (read: farmer babies) is a laborious process and requires lots of forward planning, so players have to carefully budget what they will do. But because there are other players involved and this is a worker placement game, plans can be thwarted, so often a player’s plan A will be set aside while they devise plan B on the fly, which slows the game down. With seven occupation and seven minor improvements, even beyond players familiarizing themselves with the cards at the beginning of the game, players have to consult their hands frequently to see what bonuses might be available to them. Agricola isn’t the game most prone to Analysis Paralysis that I’ve played, but it’s far from the least. I took a picture of my final farm. See? Invested. By saying the game is like work, I realize it probably sounds like I don’t like Agricola, but that’s not accurate. 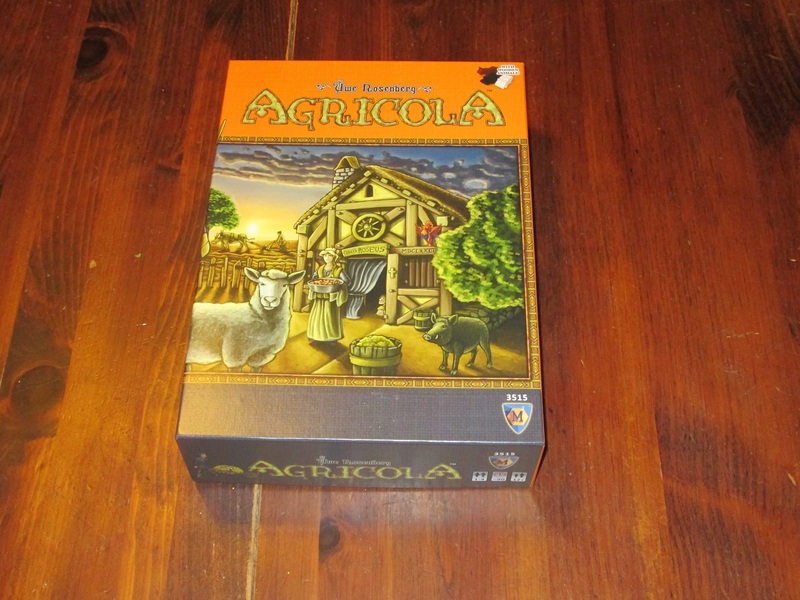 I do like Agricola–and very much. I just have to be in the right mood for it. 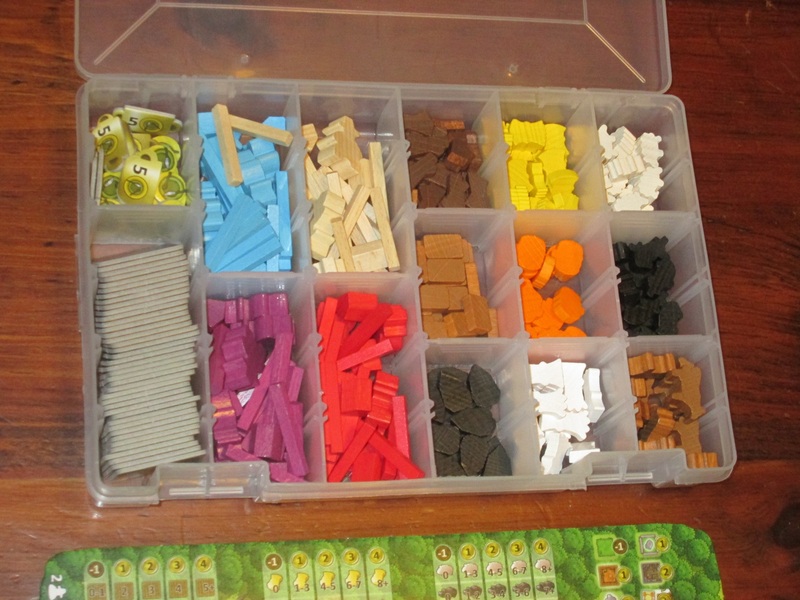 Even other thinky games like Five Tribes and Tigris & Euphrates don’t stop me in my tracks the way Agricola does. As such, each play (at least with others) is an event–something I have to mentally prepare for. The game feels like work, but it’s rewarding work. As tough as it is to scratch a living from the dirt, it is quite rewarding to survey your farm at the end of the game and marvel that your family is still alive–and even more than that, thriving. It’s the kind of game where afterward you’re proud enough of your farmstead that you want to take pictures of what you’ve built. Sure, no one else will care (and neither will you outside of this moment), but the point is that players are invested in the outcome. The “family” game of earlier editions is gone, but the rulebook does offer a way to simplify the game. I’ve played Agricola most in the solitaire and two-player modes, but I’ve also played with four. The game scales nicely for all counts–more or fewer spaces are available depending on the number of players. I think my preference is the two-player mode: it’s your turn more often, and there are fewer people to bog the game down with deliberation. I imagine if I played with players who are familiar with the game, I’d probably be fine playing with larger groups, and I wouldn’t turn it down. It may be nostalgia, but I like the head-to-head game best. (My wife and I both prefer full-game Agricola to the two-player-only All Creatures Big and Small, for what that’s worth.) The solo game is also very well done. All of the spaces are open to you, but you start the game with no food, and each harvest requires three food per adult. The rules supplement includes optional campaign rules to make the solo game more interesting, and I really enjoy this. It allows me to take my time deliberating over the puzzle without worrying I’m boring other players. 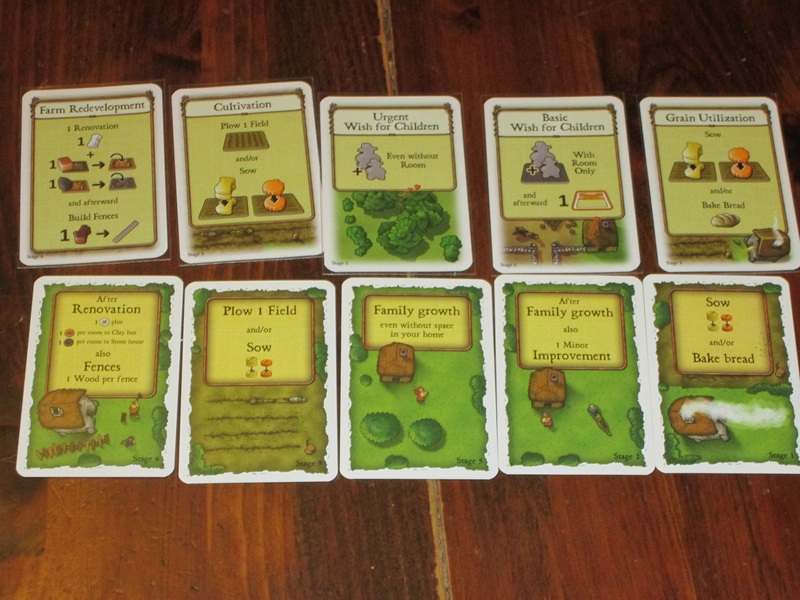 Agricola is a top-tier solo game (although do be advised: without a bits box of some sort, setup can be prohibitive). 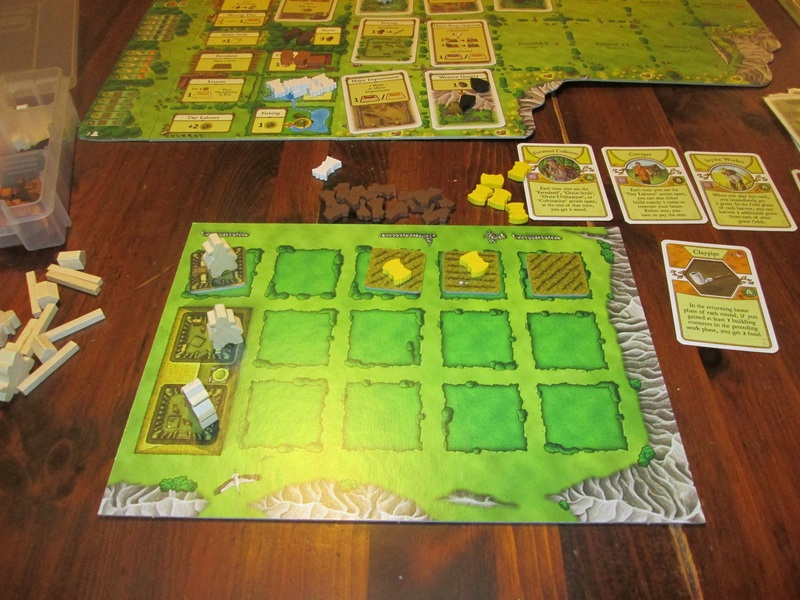 Agricola is a fascinating design of grueling trade-offs. Players have to manage their limited actions and resources and use these to build something great. Agricola is a heavy game with lots of rules (although the rules make thematic sense and become second nature quickly), so it’s not for the faint of heart. I like meaty games, and I’m not always in the mood for Agricola. But when I’m in the mood for a heavy worker placement/resource conversion Euro, it doesn’t get much better than this. Just make sure you’re ready to work hard, and you’ll reap the rewards from each play. What about the Revised Edition? Mayfair’s new edition includes many updates and changes from the earlier Lookout/Z-Man version(s). This isn’t a straight reprint; take the new edition part seriously. Beyond the lower player count (the new edition supports four instead of five), here’s what you can expect. First, the cosmetic differences. The cubes and discs of early Z-Man editions have been replaced by shaped wooden pieces. (I’m not sure how these compare to later Z-Man editions.) These go a long way toward making the game look more inviting, and they also evoke the theme better. 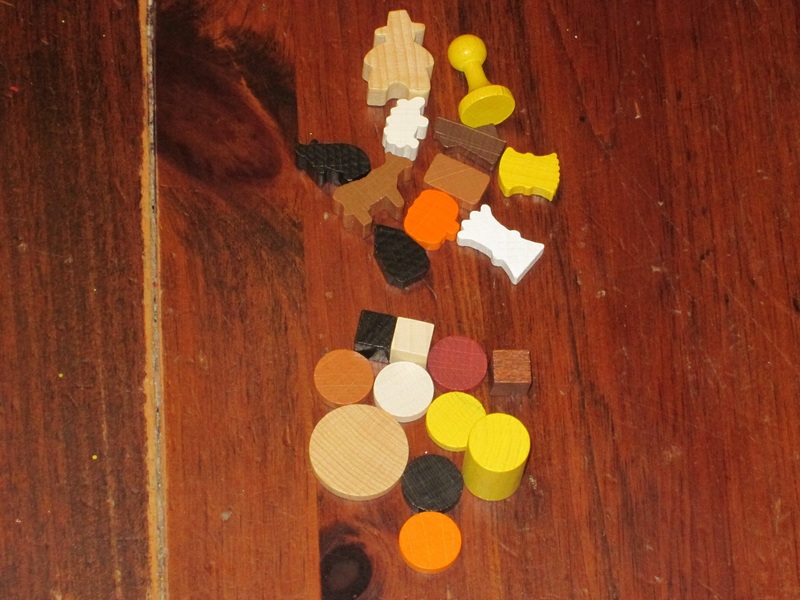 The discs were easier to stack on accumulation spaces, and the farmer action discs were easier to move around than the chunky farmer meeples, but on the whole, there’s no question in my mind that I’d choose the new wooden pieces, all things being equal. The room/field pieces have also changed. Whereas fields used to appear on the back of stone house tiles, now they appear on the back of wooden house tiles. I’m not sure the reasoning for this, but it didn’t affect play for me. There are fewer of these (presumably because the new edition accommodates 1-4 players instead of 1-5 and the new player boards have the first two rooms printed on the board), and they are also a smidgen smaller. I’ve played only one four player game, but we weren’t close to running out. I’m not sure if that would be the case in some outlier situations. We did, however, need to use the multiplier tiles because the bits bank was running low with four players. I’m not sure if we were hoarding more than most or if there are significantly fewer wooden components (an Agricola veteran who played with me said he has never had to use the multiplier tokens in the old edition), but we did run out. That said, this didn’t happen much, and the multipliers didn’t affect gameplay. (In fact, they made my farmyard easier to manage.) The new multiplier tokens are double-sided, with the other side showing -3 points for begging. These replace the cards from the earlier edition, and since begging rarely comes into play (it’s more a threat to keep players in line), these work fine. Some action spaces and action cards have changed names. They are less intuitive in gameplay terms but more thematic. (“Family growth” has been replaced by “wish for children,” “plow 1 field and/or sow” is now “Cultivation,” etc.) These don’t change the game at all, but I imagine they’ll take some getting used to if you are familiar with the older editions. The real upgrade in components is the game board. Instead of several boards that have to be arranged together, the main action board is now one fold-out board. It’s hard to overstate how cool this is. It has puzzle-piece side boards that slot in dependent on the number of players, so you don’t have to sort out cards to fit in the action spaces for the number of players. There are also a few side/variant boards that you can use if you want to change up the experience a little bit (especially if you’re playing without the cards.) I love the new board. One downside of this, though, is that the scoring aid and reminder for when action cards will become available is now included on the board, so there are no individual aids. I wish these had still been included, but they’re easy enough to create that I would expect something to show up on the Board Game Geek files section sooner or later. The player boards also no longer include the printed storage spaces for resources, but I rarely used this side to organize my pieces anyway, so I didn’t miss this feature. The new boards are the same quality as the old edition and maybe even a little stiffer. The new version has significantly fewer cards. More significantly, the new version has overhauled the cards. I recognized some cards from my old edition of the game, but some of them are new, and there are lots fewer cards in the game. While this might affect perceived value, I’m actually grateful for the change. There were so many cards in the old edition that I had trouble getting to know them. There are fewer cards here, but the replay value included in the box is still astronomical. 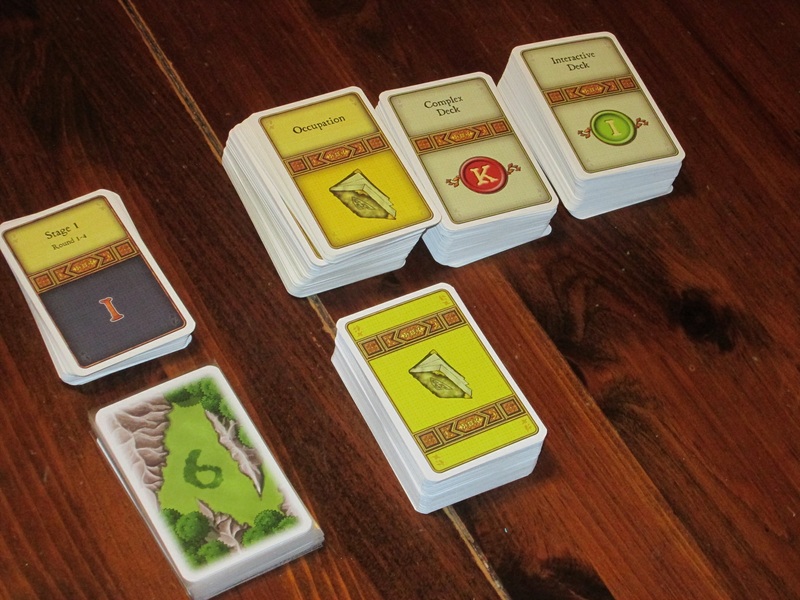 The old cards had different letters on them to mark new decks; in this new edition, the cards are marked simply A or B, a sign that this is a full Agricola reboot, not a simple change of costume. The old edition had you sort and place cards to scale the game for more players. The new version uses puzzle pieces. My advice on this new edition: If you don’t have Agricola yet, start here. There’s enough in the box to keep you occupied for a long time to come, and this is the version that will receive future support (and Mayfair has indicated that it will be supported through other releases). 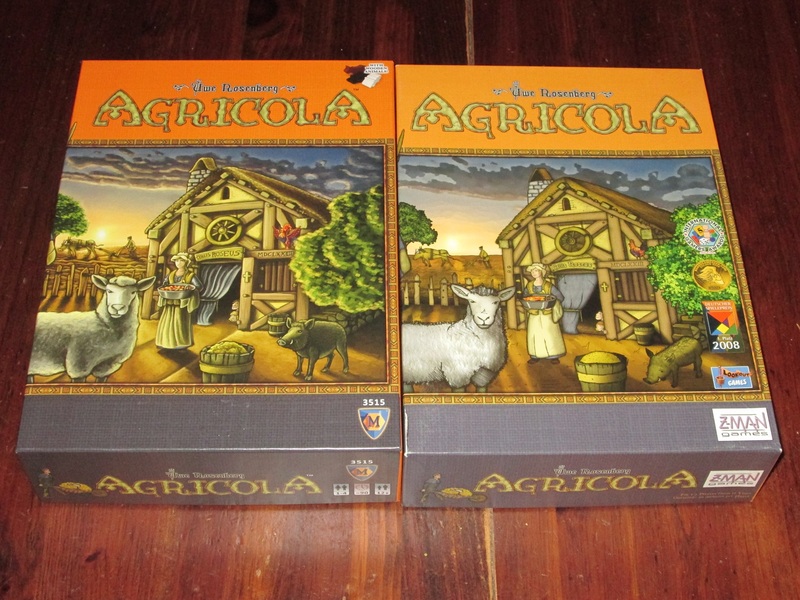 If you already have a copy of Agricola, you can probably pass on this edition. You probably like the card variety in the old edition (particularly if you’ve played a lot) and have something to tide you over until the deluxe edition releases later (which should have more cards and support more players). The components are a significant upgrade–with the few exceptions noted above–so I don’t think anyone would begrudge it should you decide to replace your well-loved older edition. 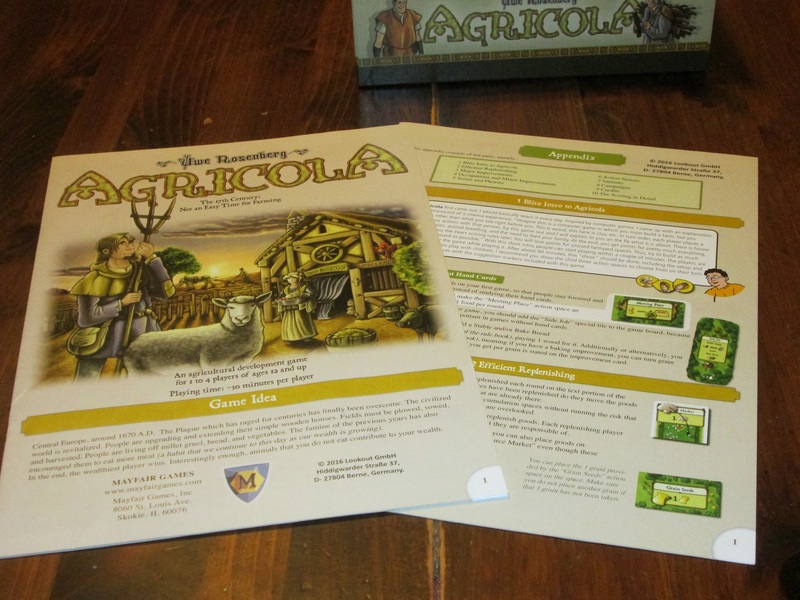 iSlaytheDragon would like to thank Mayfair Games for providing us with a copy of Agricola for review. Great review of the new edition! I was just wondering if you have a model or part number for your plastic storage (Plano?) box you pictured. Looks like it fits the pieces for this edition perfectly. It IS a pretty perfect fit. 🙂 It’s a Plano 3600. I played my first game yesterday and my components run out and we had to use the multiplier tokens too… and we were in a 3 player game. I hope it was a noob hoarding situation.